Leader of West Sussex County Council, Louise Goldsmith has said she ‘can’t wait’ for tomorrow’s royal visit from the Duke and Duchess of Sussex. 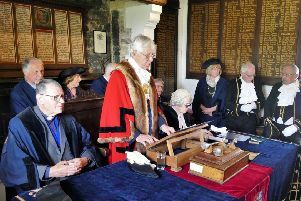 Mrs Goldsmith told the Observer: “I am so thrilled that the Duke and Duchess of Sussex will be visiting our beautiful Edes House to see the copy of the American Declaration. “Little did I think when I saw the document in the beginning of July the Duke and Duchess of Sussex would be viewing it this autumn. “This exquisite document, so painstakingly and, no doubt lovingly, handwritten exudes a sense of history that is difficult to explain. “After visiting Chichester they will make their way to Bognor Regis where they will officially open the University of Chichester’s Engineering and Digital Technology Park. “Chichester University, we at West Sussex County Council, SCC, Arun District Council and the Coast to Capital LEP have all worked together over the past few years, to make this cutting edge Technology Park a reality. “It has been designed to offer practical experiences in partnership with local industry. It is so fitting that they will opening it. “The new technological park is very much part of Bognor Regis’s regeneration – a modern town offering technological and creative arts opportunities for the young. “I hope the sun shines on Wednesday – and I know so many will be out to give this very special couple a really warm royal welcome.